* I was recently trying to figure out how to invert the CDF of a binomial distribution in Stata and realized that there is not built in command. There is an invbinomial command but it is inverting a different value than I expect. fewer successes in floor(n) trials is p.
* I might be confused but this is not the definition that I think of as an inverse CDF. * Sure it takes a cumulative probability and returns a parameter but normally I think of a invCDF as taking a cumulative probability and parameters and returning a value. For example invnormal takes the p value and returns the z value that corresponds to that p value. Likewise, invgamma take an "a" and "p" value and returns an x value. * We will set the number of trials to be 10. * Instead the CDF seems to be giving us invCDF(P,k)=theta, which is certaily useful for some purposes but not what I want. * So, I will attempt to write my own CDFinverse. I don't know how to write functions in Stata so instead I will write a small program that may do what I want. * Let's define the arguments of the program. * N is the total number of trials. * p is the probability of one outcome being a success. * newvar is the name of the new variable to be generated. 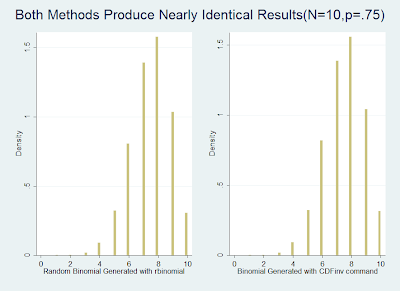 * The challenging thing about trying to invert a CDF for a count distribution is that the CDF is a probability mass function with discontinuous regions. 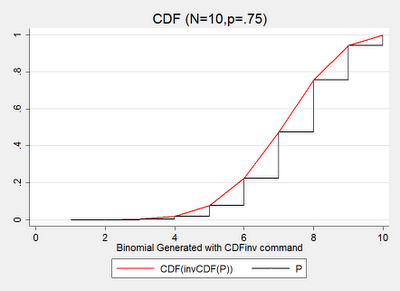 * Thus we can simply count how many times the "steps" of the CDF fall below the target CDF level. 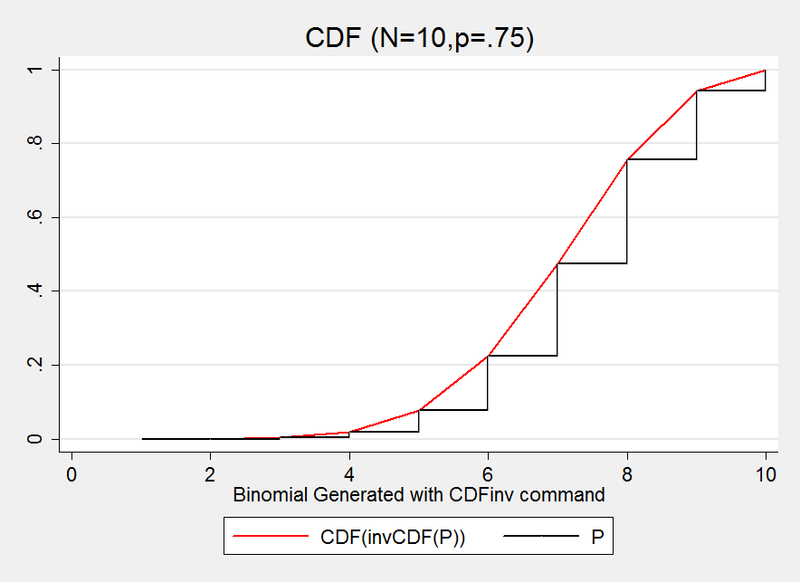 label var `newvar' "Inverse CDF of binomial"
* Add 1 to the variable value every time the CDF(n,k-1,p) is less than the target CDF value P.
* Using the first cdf generated by the summing of the pdf, this command seems to be working pretty well. * Though I am not sure why it jumps from 1 to 3. I suspect this is the result of rounding error. * The true test is if I were to plug a uniform distribution into it if it would give me the same distribution as the random binomial distribution generator. * To establish our benchmark. 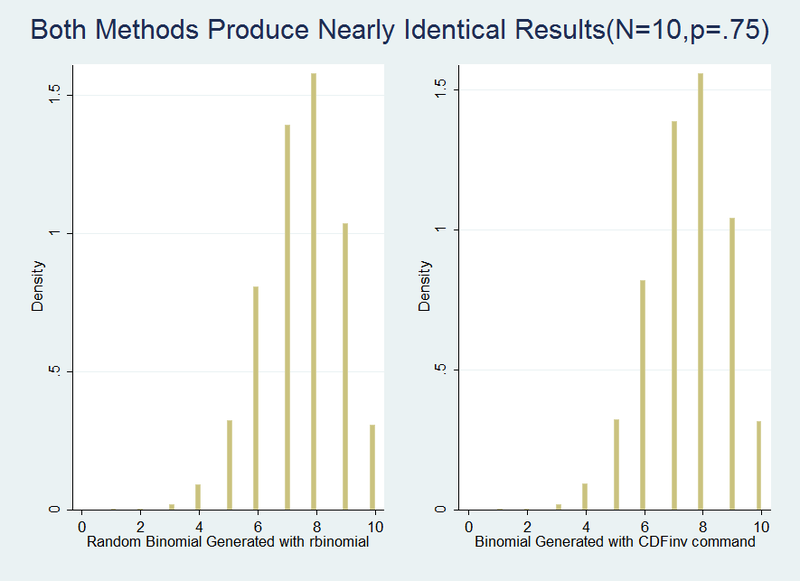 label var bin_benchmark "Random Binomial Generated with rbinomial"
label var bin_gen "Binomial Generated with CDFinv command"
* Both the means and standard deviations are very close. * We can get a step graph to attempt to see the difference. * Okay, this is does not look not bad. * To further confirm that things are working properly we might try comparing the two histograms. * I cannot tell the difference between the two distributions. Thus I am finally satisfied.